Basically, this recipe is just the Raw Chocolate recipe with added dates and nuts. Melt the coconut oil and add the maple syrup. Whisk and add the cocoa powder. Then place the pitted dates and chocolate mixture into a blender or food processor. Blend until a smooth paste forms. Scrap down the sides of your machine as necessary. Remove paste into a large mixing bowl and add the fresh almond pulp and chopped walnuts. Mix until well combined. Line a lamington tin with grease-proof paper and spoon in the brownie mixture. Place another piece of grease-proof paper on top of the mix and smooth down until its about 2cm thick. Pop in the freezer for 5 min and then remove. With a sharp knife cut into brownie squares. 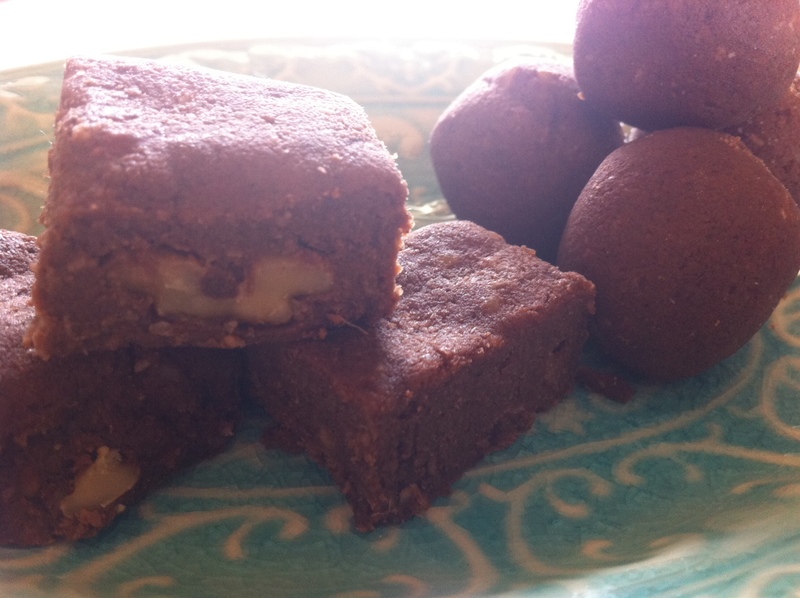 OR take heaped teaspoons of mixture and roll into bit-sized brownie balls. Place in the freezer for about 20 mins. Serve cold. The slice can be severed plain or with my raw Chocolate Ganache spread generously over the top. Delish!